Zion (or Tragic Moments) (or A Lad In Vein). This is the black hole of Bowie songs, bereft even of a title—various bootleggers have dubbed it “Zion,” “A Lad in Vein,” “Love Aladdin Vein” and “Aladdin Vein,” while Bowie, in his one public reference to the track*, said it was to be part of a musical called Tragic Moments. Nor has anyone turned up any direct evidence as to when it was made, though it was almost certainly cut in either the last Aladdin Sane sessions in January 1973, or (most likely) the Pin Ups sessions of July-August ’73, or (least likely) the early Diamond Dogs sessions of October-November ’73. Nor is “Zion” really a composition, as Bowie just provides dummy lyrics over a series of improvisations (though the track’s not a jam—it’s definitely arranged and mixed). The track’s more of a vestibule between Bowie’s early ’70s work and the latter half of the decade: it’s a musical sketchbook burgeoning with ideas—melodies, riffs, rhythms—with Mike Garson developing on his “Aladdin Sane” piano solo, while also providing some gorgeous accompaniment on Mellotron, while Mick Ronson’s full-blooded guitar makes you mourn that he didn’t appear on Diamond Dogs. Some phrases and melodies in “Zion”‘s middle section turned up as connective tissue between “Sweet Thing (Reprise)” and “Rebel Rebel” on Diamond Dogs, while Bowie’s vocal melody, which ranges from music hall to the slightly Eastern (there’s a touch of “Silly Boy Blue” in it), seems an ancestor to a number of tracks on Low, Lodger and other later records. 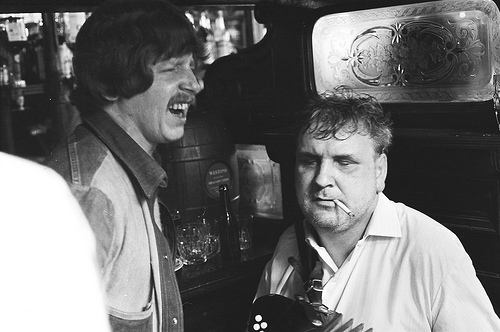 Top: “WillemGT,” “Smoking blind accordion player,” London, 1973. This entry was posted on Wednesday, August 11th, 2010 at 10:15 am and is filed under Middle RCA Years: 1973-1976. You can follow any responses to this entry through the RSS 2.0 feed. Both comments and pings are currently closed. Its one of the best outtakes ever with some blistering Ronson guitar and sounds like its from the Alladin sane sessions to my ears..we can only guess? I think Bowie does just fine on Diamond Dogs without Ronson , in my estimation he comes over as quite an accomplished player and theres some fine grating experimental material in there (end of Sweet Thing)in my humble opinion better than many of his later session players. Very entertaining — must come back and read everything — a must for Bowie fans! In Vein) | Pushing Ahead of the Dame <Loved it! Why has nobody asked Mike Garson about this song? Maybe he has some memories about it when it was recorded.